The Kita Ku collection adds a little style and sophistication when it comes to big size clothing for women. Standing by our commitment to create stylish, designer clothes that are tailored to the curvy woman, you are sure to be able to find a huge range of clothing that will both flatter and provide comfort. The new Kita Ku Winter collection is now available, and has been making waves and turning heads for its use of several patterns and styles that borrow from traditional Balinese fashion. With three distinct, eye-catching design patterns to choose from, you will be able to mix and match the tops, bottoms, dresses, and accessories that suits. The Aztec print collection is the first of three patterns that are designed to catch the eye with their stylish lines and shapes that hint at the iconic ancient Aztec designs. The Singlet Paris is an excellent example of this collection, with its long line combo style with button trim featuring flattering black with yellow Aztec pattern trim. An excellent choice with pants or a skirt for a sophisticated look and comfortable look. Also in the Aztec pattern range for this season’s winter collection is the exquisite Lotus jacket. It features edge to edge trimming with long sleeves and inclusive internal side pockets. With its captivating yellow and black Aztec print, this lightweight stylish jacket is the perfect combination with the matching pants and singlet. 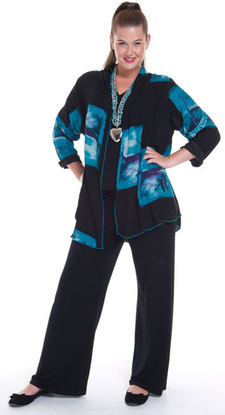 With its ¾ length sleeves and flattering trim, this number aims to flatter your figure without skimping on style. The second line this winter is the Twilight print collection, which offers you something classy to wear in the evening. This collection is a perfect accompaniment to your little black clutch bag and is suitable for dinner parties or everyday use. The Candy Singlet is the first of the winter collection recommendations, thanks to its simple single deep blue colour and flattering length. Length of a top or singlet is always an important factor when buying big size clothing for women and with this sleek look and single colour, the singlet can be paired with any matching pair of pants to finish the look. One of our favourite dresses that appears in the Twilight winter collection is the Matrix dress. This beautiful lengthy number has the twilight pattern and colour scheme that Kita Ku is famous for. Offering a bold pattern in a deep blue and black, the dress features a double layer open front with ¾ sleeves for effortless sophistication. Available in a wide selection of sizes, the Matrix dress is perfect for a winter evening party, thanks to its front button trim. The Venezia print is, quite simply, a stunning design. The dark colour and turquoise blues work perfectly together and are slimming and flattering to the wearer. In this collection, one of the stand-out items has got to be the Lulu Jacket. Featuring an edge to edge trim, this versatile jacket offers a ¾ length turned cuff sleeve, as well as pleating on the shoulders, for that sophisticated look. Our winter collection allows you match the tops and singlets with the available pants and dresses that Kita Ku has to offer. So for all of your wholesale clothing needs when it comes to winter this season, Kita Ku is leading the way in big size clothing for women, setting new styles with our pattern collection.